Delanie Gourley hails from Lakeside, California. She went to school at El Capitan High School and played travel ball for the Southern California Athletics under Coach Bruce Richardson. In her time as an Athletic, Delanie won three straight PGF 18U National Championships while delivering her high school’s first state championship in 2012. She would finish her high school career with 1,352 strikeouts, which was good for 10th all-time in the state of California. With traditionally good softball programs like UCLA, Oregon, Arizona, Washington, and Arizona State nearby, it’s amazing that Delanie chose to come all the way to the state of Florida for her college career. I briefly talked with her father, Dave Gourley, about the recruiting process and he provided some more insight on the matter. 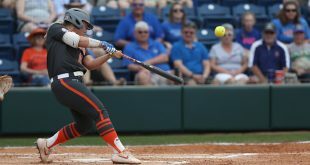 The Florida Gator softball team has seen tremendous success since Delanie Gourley arrived on campus as a freshman for the 2014 season. That year, the Gators posted a 55-12 record on route to the first National Championship in school history. As a youngster, Delanie played a big role in that championship season. She held a 15-1 record with a 2.67 ERA, 127 strikeouts, 47 walks, and two saves in 107.2 innings pitched. When the postseason rolled around, Delanie started the first game of the Gainesville Regional. With the Florida A&M Rattlers as her opponent, the young lefty made history. She became the first Gator pitcher ever to throw a no-hitter in the postseason as the Gators mercy-ruled the Rattlers 8-0 in five innings. 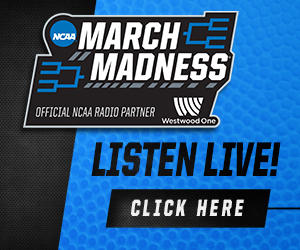 As Florida advanced deeper into the postseason, head coach Tim Walton was not afraid to use his freshman in a high leverage situation. 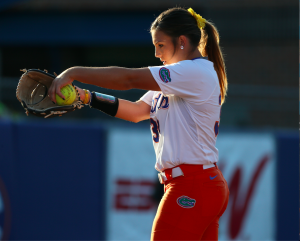 With the Gators one win away from a National Championship, Delanie came on as a reliever in Game 2 of the Women’s College World Series. Her task was not an easy one, as the rival Alabama Crimson Tide had runners on second and third with no outs in the fourth inning. She remained unfazed though. 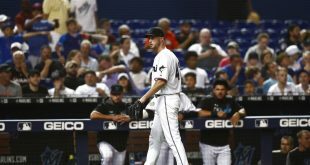 Delanie struck out the first two batters, walked the third, and then induced a bases-loaded groundout to escape the jam. In the fifth inning, Delanie would return. She struck out the leadoff hitter before getting the next two Tide batters to fly out. Two innings later, Hannah Rogers would throw a comebacker to first base to secure Florida’s first-ever softball national championship. Delanie would ultimately be awarded the win in the clinching game. 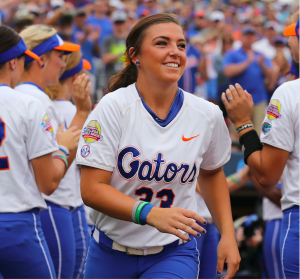 The very next season in 2015, Florida went 60-7 and cruised back into the Women’s College World Series. Delanie had a solid sophomore campaign. She went 10-2 with a 2.13 ERA, 105 strikeouts, 32 walks, and five saves in 79.0 innings pitched. After gaining vital experience as a freshman in the first title run, the lefty was yet again ready to answer the bell in the postseason. In Game 1 of the Women’s College World Series, Delanie entered in the seventh inning to close out the game. Facing the Michigan Wolverines this time, she worked past a leadoff walk and subsequent single to record three outs and earn the save. Winning Game 1 would prove to be crucial as the Gators would ultimately need three games to win a second consecutive national championship. As one of the workhorses for 2016, Delanie put up career-high numbers in her junior season. She went 18-3 with a 0.73 ERA, 206 strikeouts, 46 walks, and five saves in 143.2 innings pitched. In the regional semifinal against the UCF Knights, she allowed just one hit in seven scoreless innings as she fanned 13 batters. Florida would comfortably win 5-0. In the super regional opener against the rival Georgia Bulldogs, Delanie was bested as the Bulldogs scored three runs off her and won 3-0. This would unfortunately be her final outing of an incredible year, as Georgia would hit a walk-off home run in Game 2 and advance to the Women’s College World Series. With such a decorated career, Delanie is treating her final season no different than the other three. She is not at all feeling the pressure that many seniors put on themselves time and time again. Accompanying her for one final title chase are fellow seniors Justine McLean and Chelsea Herndon. Together, this trio has a real chance to cement their already incredible legacies with a third championship in four years. For Delanie, the bonds she has with Justine and Chelsea go beyond the softball diamond. Ever since she came to the University of Florida, Delanie has been one of the more intriguing players of her recruiting class. It may be because she was the first ever left-handed pitcher to play for Tim Walton. After talking to her travel ball coach, Bruce Richardson, I was told what advantages Delanie possessed as a southpaw. The stats definitely back up Coach Richardson. Delanie is second all-time in Florida Gator history with 9.27 strikeouts per seven inning games and eighth all-time with 456 strikeouts. What’s even more exciting though, is that Delanie finally has another lefty joining her on the staff for the 2017 campaign. Katie Chronister, a local product right out of Gainesville, becomes the second lefty ever to play for Tim Walton. With the addition of Chronister, Delanie expressed much enthusiasm in having another lefty to mentor and learn from. In regards to the pitching staff, Delanie is the most seasoned of the three returning pitchers. 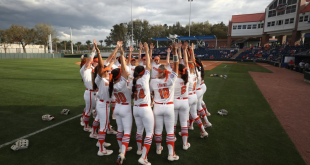 Her close relationships with Gator pitching legends Hannah Rogers and Lauren Haeger during her first two seasons gave her invaluable experience. She also took away the important lesson that the staff goes beyond more than just one quality arm. 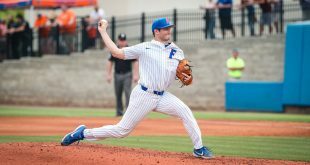 Adding another pitcher -let alone another lefty- gives Florida a plethora of pitching options, but Delanie gave her assurance that there is no unhealthy competition among the pitching staff. Though the Florida Gator chapter of her softball career will come to a close after this season, Delanie still plans on playing after college. 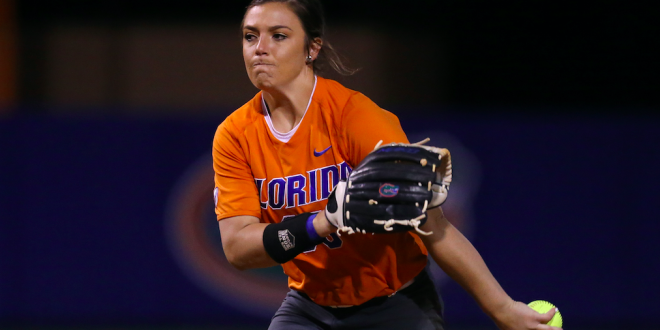 After four Gators were selected in the 2015 National Pro Fastpitch Draft, it can be safely assumed Delanie will be a high pick if she equates or surpasses her numbers from last season. If the statistics alone don’t do it, just the fact that she is a left-handed pitcher should draw interest from all six of the NPF franchises. Delanie Gourley has been doing big things ever since she started playing softball. Regardless of the stage, she has always been ready to respond with a competitive demeanor and a smile on her face. In the closing moments of my interview with her father, he told me a humorous story about Delanie’s competitiveness. “She was just very athletic and competitive. Her brother is three years older than she is and so she watched him for three years playing sports and he played soccer. If he got a goal, we would take him to Dairy Queen and get him a banana split. When Delanie was four, it was her first game and she said ‘hey do I get a banana split if I score a goal?’ and I said ‘sure’. Whether it be banana splits or national championships, Delanie has always been a player who will do what she can to achieve her goal. She uses her competitiveness to her advantage and is determined to win that battle against the batter every time. 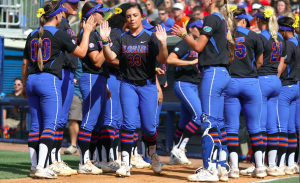 No matter what happens this season, she has definitely made her imprint during the golden era of the Florida Gator softball program.